This version of the Spanish flag was the Naval Ensign from 1785 - 1931. It was also the national flag from 1843-1873 and 1874-1931 3'x5' polyester flag with white header and two grommets. Most flags have four rows of stitches on the fly and two rows on the top, bottom, and header side. Image is screen printed and appears on both sides. 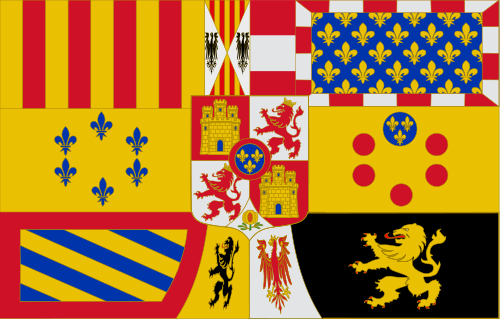 The Royal Banner of Spain while under the control of the House of Bourbon. From 1761-1868 and 1875-1931. 3'x5' polyester flag with white header and two grommets. Flags have four rows of stitches on the fly and two rows on the top, bottom, and header side. Image is screen printed and appears on both sides. The current version of the Spanish flag was adopted in 1978. A version of this flag started out as the Spanish Naval Ensign in 1785. It became the national flag in 1843. The flag coat of arms has gone through several changes. 3'x5' polyester flag with white header and two grommets. Image is screen printed and appears on both sides. The current version of the Spanish flag was adopted in 1978. A version of this flag started out as the Spanish Naval Ensign in 1785. It became the national flag in 1843. The flag coat of arms has gone through several changes. 2'x3' polyester flag with white header and two grommets. Image is screen printed and appears on both sides. The Spanish flag without the crest. 3'x5' polyester flag with white header and two grommets. Image is screen printed and appears on both sides.